Do you want reliable and reputable asphalt paving contractor in Bergen County NJ? Give us a call at (201) 327-5258 today so we can set up an appointment to provide you with a solution. Find exciting online coupons and specials when you click here now. Having a trusted asphalt paving company in Bergen County NJ on your side is a wise idea when you’re thinking in the long term. 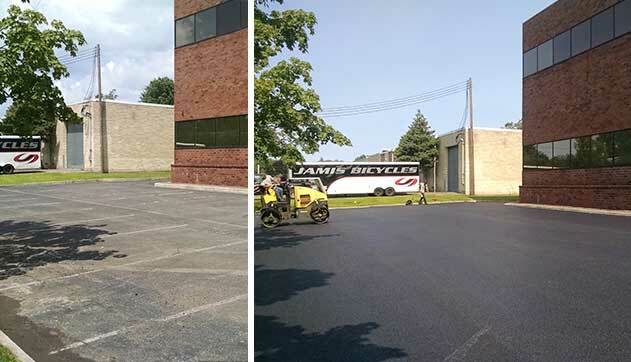 While asphalt is a highly versatile material for roads, parking lots and other surfaces, it doesn’t last forever and at some point, you will need maintenance performed to keep it stable and functional. Factors such as traffic volume, temperature fluctuations, moisture in all its forms and exposure to chemicals can weaken pavement and cause fading, cracks and potholes. This type of damage can create safety issues for the people using the asphalt, and it doesn’t look very attractive. Learn what your neighbors are saying about our service when you click here! When you keep your asphalt properly maintained by calling a trusted driveway company in Bergen County NJ, it won’t crack and dry out, reducing the likelihood of the pavement becoming brittle and breaking. We’ve all seen a cracked, dried out parking lot that seems to have dips and holes every few feet. Over time, the sun will essentially cook the moisture out of the asphalt, leaving a gray surface that is both fragile and unattractive. By having maintenance performed on your asphalt surface, you can keep it as close to its original state as possible. What Happens During Asphalt Maintenance? Different companies may use slightly different methods or techniques, but for the most part, asphalt maintenance consists of a handful of steps. The first is to clean the surface, including the existing cracks and holes. Grease stains must be gone and any physical debris must be removed. Next, the damaged areas must be repaired. Any holes and cracks must be filled before they become larger cracks and holes. If it has been at least a couple years, or if your contractor feels it’s necessary, you should have the area sealcoated to protect the repairs and the stability of the surface. Once the maintenance plan has been put into effect, the area has to be blocked off so the sealcoat has time to cure properly. If the damage to your pavement is bad enough, your contractor may suggest resurfacing to provide even more stability than basic sealcoating. Resurfacing consists of paving over the existing surface with another layer of asphalt, and while it isn’t as strong as a full replacement, it will strengthen the asphalt considerably. Call McFarlane Asphalt at (201) 327-5258 when you need a paving contractor in Bergen County NJ you can trust, and we will set up an appointment for someone to visit your home and provide an honest estimate for your asphalt maintenance project.